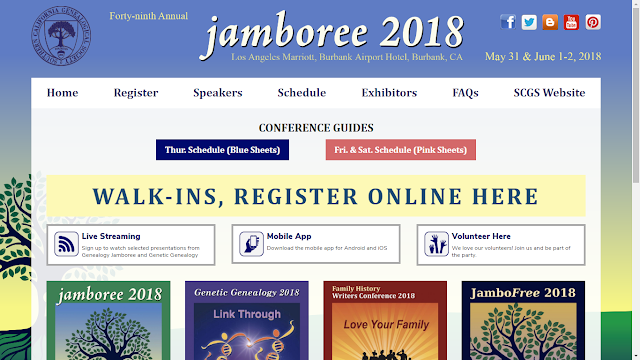 Linda and I are driving to Burbank today to attend the Southern California Genealogical Society Genealogy Jamboree Conference on 31 May through 2 June. The conference is at the Los Angeles Burbank Airport Marriott Hotel. 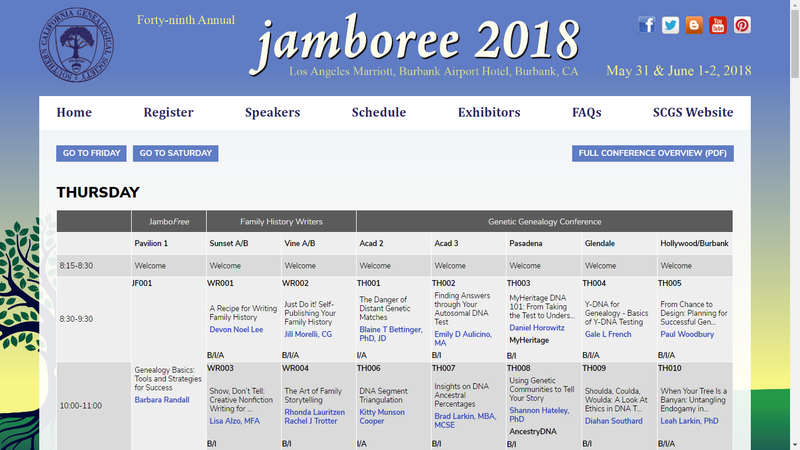 The Genealogy Jamboree web page is at http://genealogyjamboree.com/. There are links on the page to Register, the list of speakers, the class schedule, the list of exhibitors, and the blue sheet (Thursday) and pink sheets (Friday and Saturday). There are also links to the live streaming classes, the mobile app, and volunteer opportunities. The Friday and Saturday schedules are also available. On each day, all classes are listed. I downloaded the SCGS 2018 mobile app to my iPhone and my tablet. The handouts for the classes are available on the mobile app and can be downloaded to the device or emailed. I emailed about 20 of them to myself - the ones I might attend. I will print some of them out and take them with me. As a registered attendee, I will get PDF files for every available handout on a flash drive when I get to the conference. * Wednesday, 30 May: We drive to Burbank and get checked into the hotel. Perhaps we can have dinner with other attendees. Any takers? 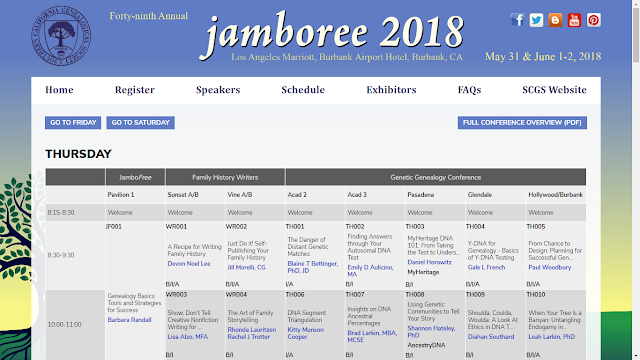 * Thursday, 31 May: I did not sign up for the one-day conferences on Genetic Genealogy and Writing Family History. I did volunteer to be the room monitor for Barbara Randall's Genealogy Basics class in the morning. I may visit at the Genealogy world tables in the afternoon. The Expo Hall will open at 12:30 p.m. this day and I will spend some time there. Dinner - who knows? * Friday, 1 June: My goal each year at Jamboree is to attend classes at least half the time. There are 6 class times, so I will go to at least three classes, and maybe four. I will probably spend significant time in the Expo Hall, talking to exhibitors and taking photos. Dinner - who knows? * Saturday, 2 June: There are six class times on this day, but we have to leave at 3:30 p.m. So I plan to attend classes at at least two of the four times. Again, I will spend significant time in the Expo Hall. We are going to drive home on Saturday, and will stop for dinner in Huntington Beach with our daughter's family and the three grandchildren and then spend time at their home. That's the plan - all we have to do is execute it. If you are going to be at Jamboree, please stop and say hello to me wherever we may be. Linda spends time in the swimming pools, and we usually have lunch at the food service between the buildings. We usually have breakfast in the "Blogger's Lounge" by the hotel lobby, and often there are groups of attendees there or in the hotel restaurant. Dinner is a challenge because Linda cannot eat most of the menu in the hotel restaurant (she has soy, shellfish allergies), so we often go out to Burbank area restaurants.